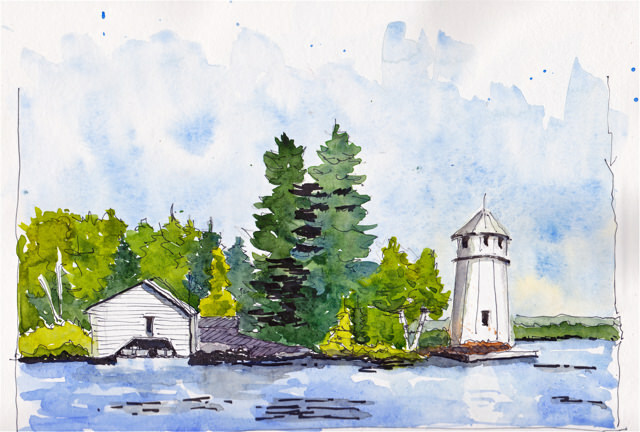 Here is a sketch done this week of the lighthouse on our lake in Eastern Ontario. The lighthouse was constructed in the 1930’s and has been a reliable guide around the point for many years. Apparently, it was originally designed to generate electricity, not as a navigational aid. And the rumour persists that both Henry Ford and Thomas Edison stayed at the lighthouse cottage. Whatever the stories about its past, the lighthouse still stands proudly, a unique marker at the entrance to the main part of the lake. It embodies the lake history and traditions and no matter how many times we pass, and that is often because the lake is 80% water-access even today, gives a sense of stability and well-being. As for the sketch, I am experimenting with a Japanese brush pen which uses carbon ink cartridges. I’m liking it for the very darks, but in small doses. The 121 is a new design which you saw first here. We’ve been road-testing the first two and they have proved themselves great day bags. They are big enough for wallet, phone, notebook and other essentials and yet light enough to sling over your shoulder for a day out. I am finally back in the studio for a few days and here are three more in scrumptious colours. 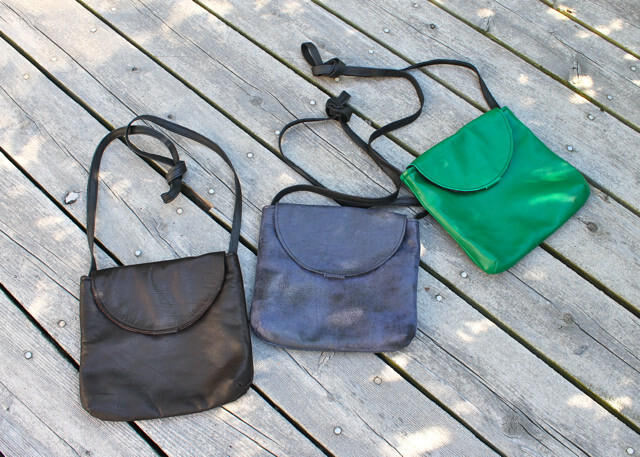 Each of these bags is made from a leather remnant, so each is truly one-of-a-kind. Mocha, denim and emerald. 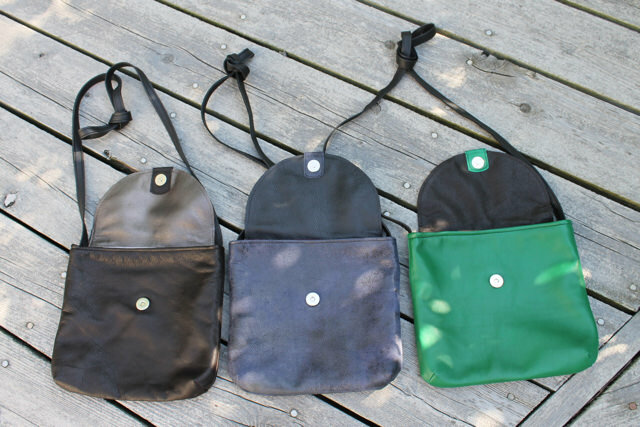 Each bag is 9.5″ wide, 8″ tall and 1.5″ deep. 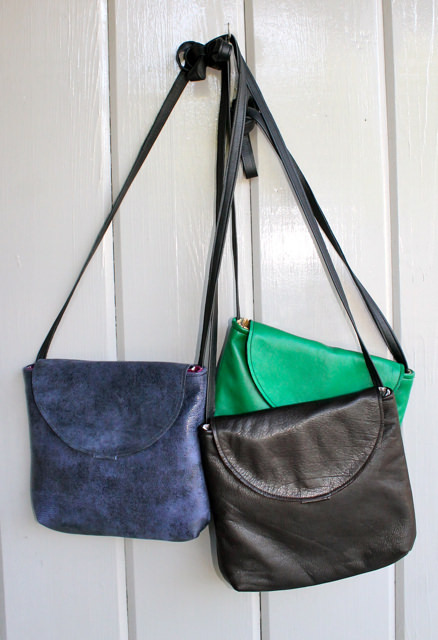 They have a flap lined in contrasting leather which snaps shut with a magnetic closure and a narrow black leather cross-body strap which can be knotted to shorten. 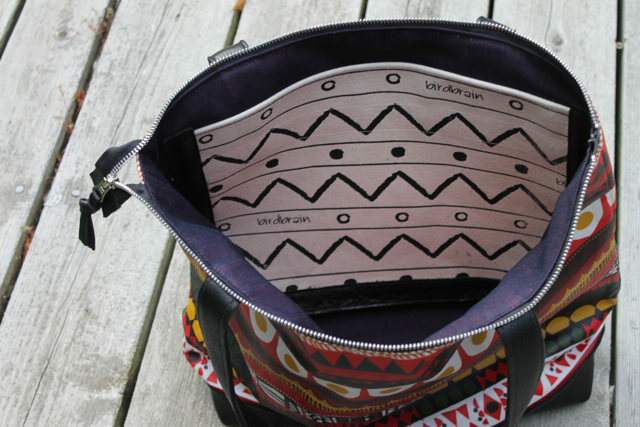 Inside each has a great lining–you can just see the fuchsia dot fabric peaking out of the denim leather bag in the last photo–with a pocket for phone or credit cards. 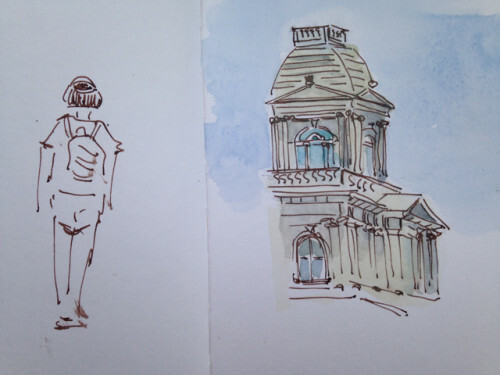 We’re home from our week in Portland but I still have a couple of sketches to share. 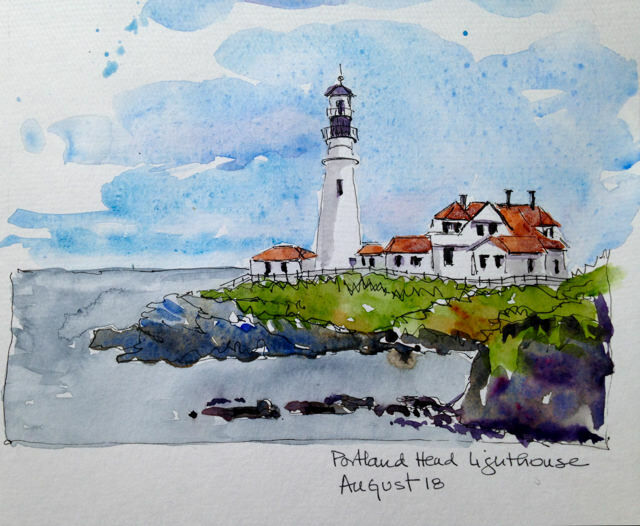 We spent last Thursday morning at the Portland Head Lighthouse. It is situated in a beautiful park with lots of walking trails and an excellent small museum. 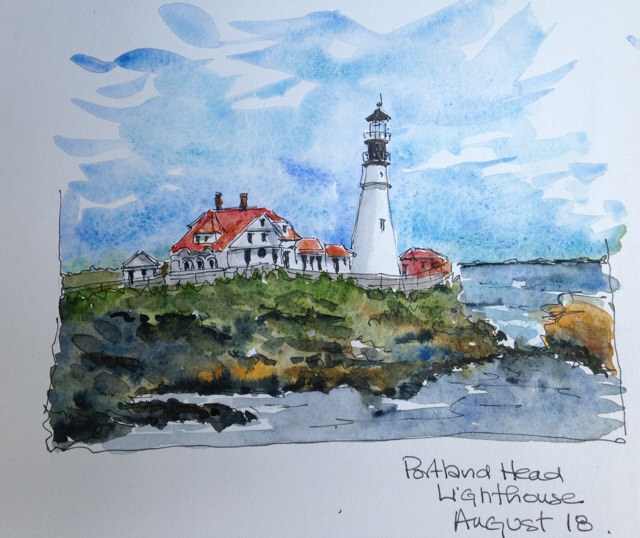 It was glorious weather and I had a chance to sketch the lighthouse from both sides. There were other sketchers there as well. 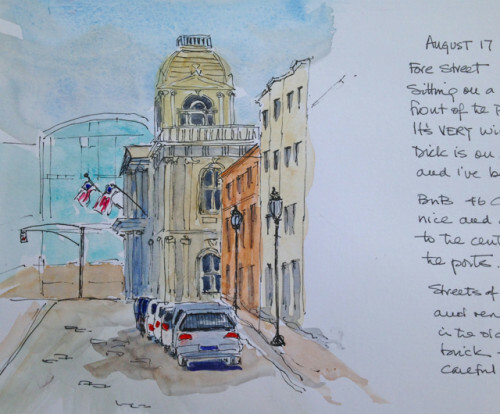 This is a much loved and much sketched landmark and it was a pleasure to take part in a long tradition. We have been travelling this week, to a favourite city and a new one. On the way we stopped in a book store for maps and I happened on How to Sketch People by Matt Pagett for such a sale price that I could not resist. And it is a perfect find to begin a trip where I hoped to push myself to sketch more. On the first pages he states his view of sketching: A sketch, as opposed to a drawing, its close cousin, can be characterized by a rapid yet considered execution, an instinctive response to a subject, a certain roughness, life caught on the fly. And on the next page: …the moment I stop to look and think about what I see, it always comes with a mixture of surprise and relief. All the inner brain workings now relate to the outer world, and within that newly created space is some kind of harmony. It seemed a kind of permission and encouragement for my rough and wonky sketches. An invitation to harmony. Se here they are. 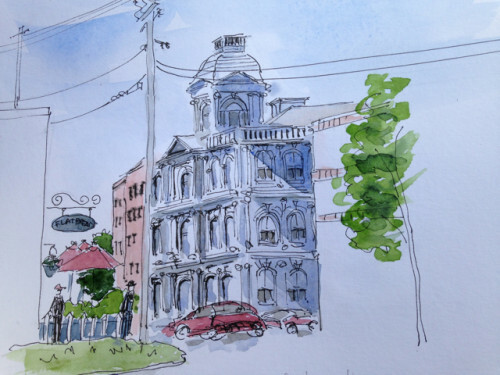 The first a 5 pm sketch in Montpelier VT after a long day of driving. 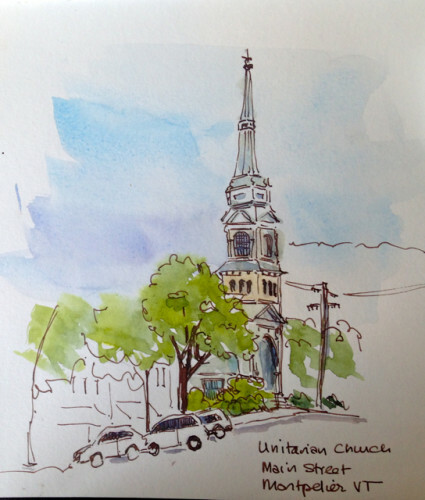 The sun was still lovely on the Unitarian Church. Monteplier has so many wonderful buildings. I hope to catch more on the way home. 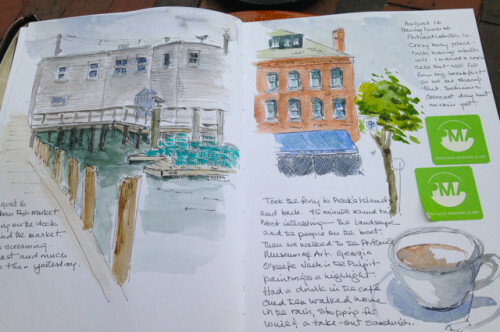 And a double page sketch of the wharf behind the fish store and a couple of sketches made while eating a lobster roll. The lobster disappeared too quickly to sketch! 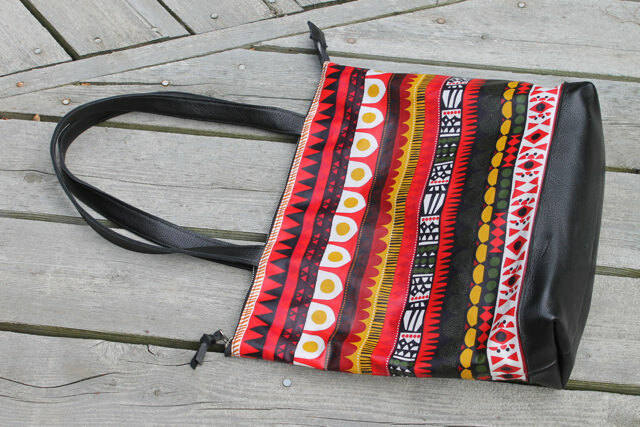 Here is a new coated cotton tote in the Raanu pattern–a series of bright stripes in red, yellow, green and black. This is one of my favourite Markmekko prints because it looks great in all four seasons and, of course, the coated cotton wipes clean with a damp cloth. This tote has a black leather base and wide leather carry handles with a 12 inch drop. It closes with a durable metal zipper with a leather pull tab. Inside it is lined in dark denim with an orange waxed canvas double zippered pocket and a large canvas pocket with birdbrain graphics. 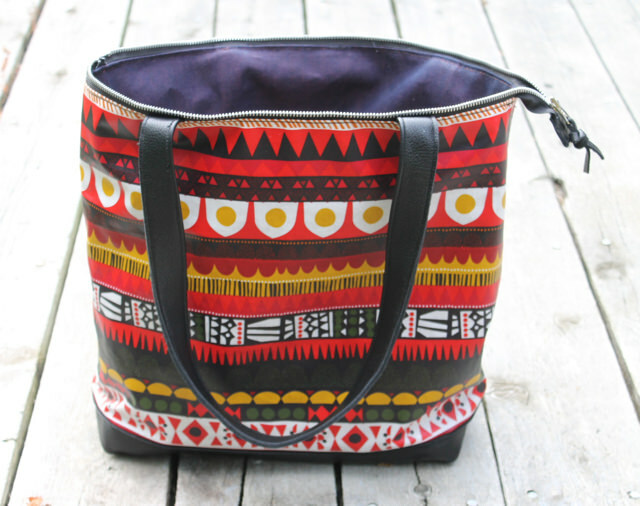 The tote measures 17″ wide, 14″ tall and the base is 5″ deep. 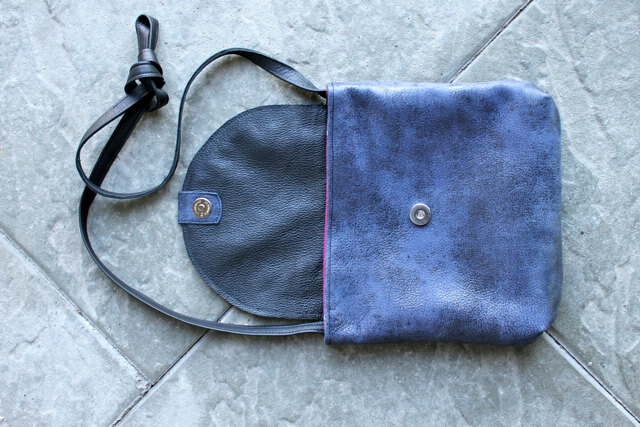 This is a great bag to carry all you need for work or for the weekend. Here are a few small mats I’ve been working on inspired by my summer on our lake. The terrain is rugged with rocks in beautiful colours–it is the Pre-Cambrian shield after all– and tenacious pines bending out over the water. These pieces combine wool strips left over from other projects, as well as yarn and fleece. It’s a great joy to sit on the verandah, listen to the water lapping, the loons calling and hook the views around me. 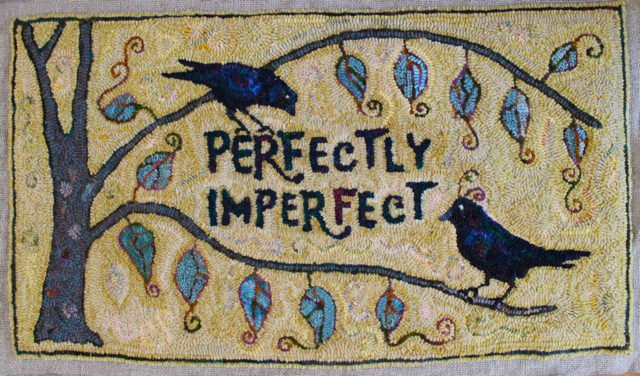 I took a great rug hooking course this month in borders with Wendie Scott Davies. (Read here to see one of the things that happened at rug school and you will get an idea about how much fun we had.) At any rate, we were to bring the centre of a rug to class and spend the week designing and hooking a border. I started with this and over the last month have finished what I am now calling Crows’ Choice. It’s interesting how a rug develops. We had some discussion about whether this tree and branches are actually a border–I think they are, but just to fulfill obligations, I put a single line around the outside to create a ‘real true’ border. The crows represent the two voices in my head: the one on the left critical and cautious, the one of the right full of ideas and ready to take a chance. They have an ongoing battle while I work my way through any creative project. The tree? Well trees represent many things, I’ll leave that to you. And the leaves are the ideas and creative projects, 13 of them, my key number. I really enjoyed working through this process of hooking what is in my head. And whether that trunk and those branches make a border, I’ll leave that up to you as well. Finished hooked piece is 30″ x 17″ and once it cools down, (the weather, not the rug) I’ll dye some yarn in the same yellow for whipping.